Spring is once again flirting with the frigid heart of our dear Minnesota, and based on weather reports, he'll start moving his things in this weekend; I admit, I'm optimistic about all that he'll bring: sun, tulips, salads, and his handsome friends wearing t-shirts and riding bicycles, but until the cold is gone, I'm going to keep the thermostat where it is and make more soup to keep warm. Borscht is found all across Central and Eastern Europe. Depending on its origin, the variety of ingredients are arguably as different as the ways to spell it (my friend Tanya is Russian and vehemently against the use of a "t"). Whatever the case, the soup is most often associated with beets, dowdy on the outside, it is certainly what’s inside that makes this vegetable so special. Months ago I discovered the equally unhandsome celeriac and have found plenty of ways to incorporate it into my kitchen this winter. I think celeriac is a beautiful companion to the ruby vegetable in the ruff; it is similar in texture but fresh and bright-tasting like celery offering a contrast to the earthiness of the beets. 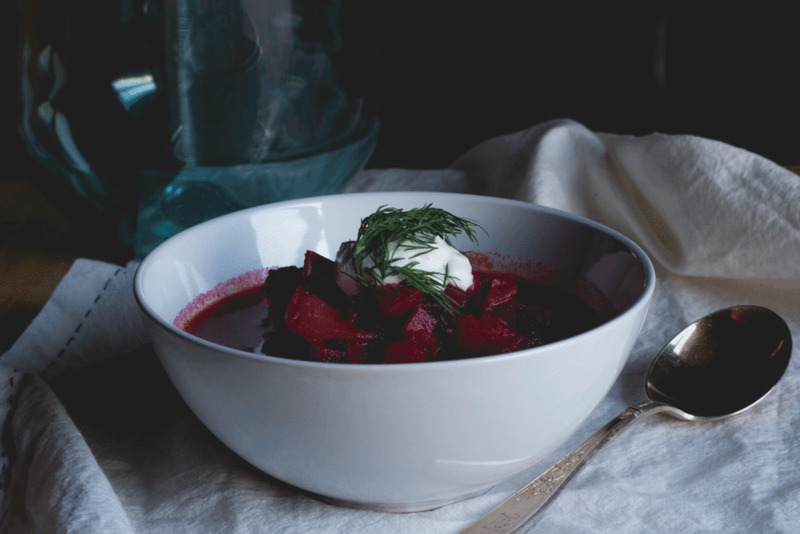 I created this recipe recalling a fabulous Ukrainian borscht recipe of my friend Logan’s family in Boston—it is hearty and makes use of the root cellar’s star vegetables. Other than lots of chopping, it requires minimal preparation and is therefore my favorite soup to make. I enjoy it most with a crisp beer, dark bread and some butter. On a high flame add two tablespoons of oil to a soup pot; when it is hot add the cubed beef. Sear and brown on all sides, afterward, add red wine. Reduce to medium and simmer for 5 minutes. Add the rest of ingredients with the exception of fresh herbs and sour cream; cover with a lid and simmer until the ingredients are tender. When vegetables are tender add fresh parsley, salt and pepper to taste. Serve with a dollop of sour cream and fresh minced dill.